Mel Silverman was my uncle. He was born and reared in Denver where he went to North High School. An outstanding baseball pitcher, he was offered a minor league contract with the Yankees organization. Instead, he decided to pursue art at the Chicago Art Institute. While in Chicago, he met his wife, Sydel Silverman, who is now a world reknown anthropologist. They lived in NYC, but they traveled extensively. Many of his works were inspired by his travels in Italy and in Israel. 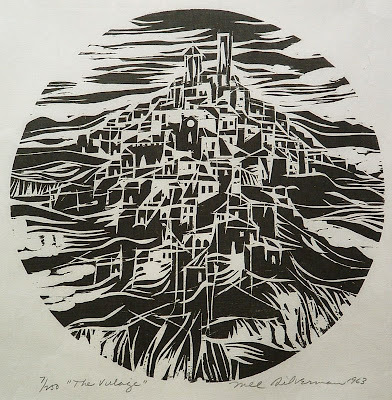 (conducting printmaking seminars at Ein Hod in Israel) He worked in many different media. I have seen collages, oils, woodsculptures, metal sculptures,charcoals, pencil drawings, cartoons, and book illustrations. Mel died of cancer when he was 35. Mel is survived by two daughters, Eve and Julie, and his widow, who continues to live in the NYC area. I am fortunate to have a number of his works, as do my parents and my brother and sister. Several of the works which I have were rescued from my grandmother's (his mother's) basement and several others were inherited from my grandmother. His widow gave my wife and me a wonderful print of a Manhattan scene as a wedding present. He was a very nice uncle. Bill thanks very much for the information. We have a wonderful work of your uncle's which is a metal collage called the "Bishops of Assisi". it is very beautiful, and it was purchased by my parents back in the '60s. We love it and it hangs proudly in our living room. Where can I get a lisiting of other works by your uncle?